It’s a little-known fact that at the first Thanksgiving feast, some of the pilgrims were sitting around the table while wishing in their heart of hearts that they were camped outside the local loom-and-musket shop in hopes of snatching up bargains. 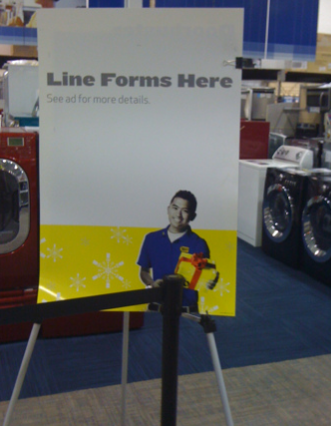 Hundreds of years later, Best Buy is finally honoring that wish by opening up at 6 p.m. on Turkey Day. This is a six-hour improvement over last year, when Best Buy had the stubbornness to wait all the way until midnight to throw open its doors to the throngs of people who love electronics and discounts, but who have apparently not heard of this thing called the Internet. Best Buy customers in Maine, Massachusetts, and Rhode Island will have to muscle through dinner with their families, as laws in those states prevent stores from giving into that animal lust for doorbuster deals on Thanksgiving day proper. Considering that Thanksgiving is now nothing but a speed bump on the way to savings (the deepest of which are on products that are rarely worth even the discounted price). How about we just call off the holiday until retailers give up this macho one-upsmanship of trying to open slightly earlier than competitors? Or at least until people realize they don’t need to drive to a flippin’ shopping center to get a good deal when their phones and computers can be accessed without ditching your family for the holiday.